Isabel Marant is a French house of fashion founded in 1994 by designer Isabel Marant. Her Spring/Summer 2015 collection is stunning. Isabel Marant studied at Studio Berçot from 1985 to 1987. Two years later she created her first costume jewelry and accessories line. The company has several shops worldwide including Paris, New York, Tokyo, Hong Kong, Seoul, Los Angeles, Beijing, Madrid, Beirut, and London. Shop this fashion brand at the Isabel Marant stores and at other fine retailers around the globe. If you are interested in Isabel Marant boots, you can find the collection at Barneys New York. You can also find footwear at Barneys such as the Lelie Ankle-Wrap Sandals pictured below. Crafted of smooth black leather, Isabel Marant's Lelie sandals are styled with a grommet-embellished topline laced with ties that wrap around your ankle in a variety of ways. 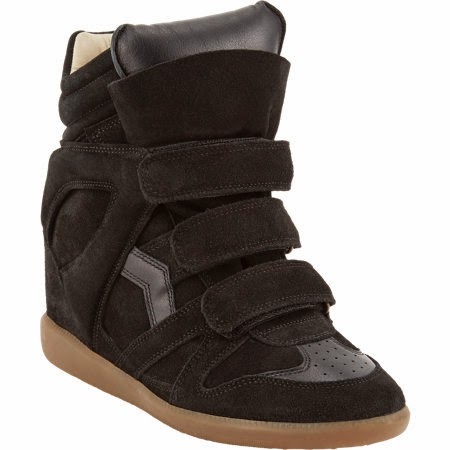 Another spectacular shoe you can find at this luxury retailer is the Isabel Marant Bekett Hidden Wedge Sneaker. Isabel Marant black suede calfskin and lambskin Bekett sneakers styled with three tonal Velcro® hook and loop straps. Thank you for taking the time to read our designer brand blog post. We hope that you have found this news to be informative.